in the area for centuries, long before Columbus claimed to have discovered this New World . . . "
When we were at McDowell a year ago I found two issues of RV Journal that described seven or eight ancient cliff dwellings and other related sites north of Phoenix but we just didn't get up there to visit any of them. I was intrigued by the stories I read about the amazing people who lived in the area up to ten thousand years ago, then either disappeared or merged into other tribes around 1400 AD (now called CE, Common Era, by the Park Service). 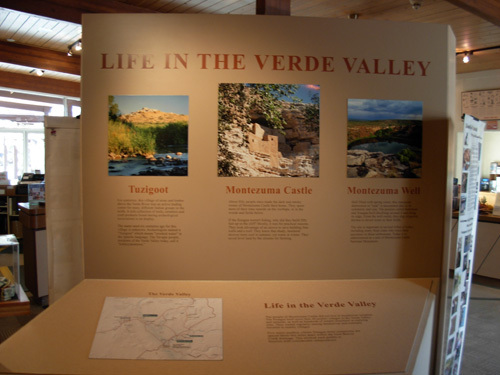 The old sites are clustered in two general areas in central and northern Arizona: the Verde River valley approximately between Camp Verde and Cottonwood, and farther north near Flagstaff. 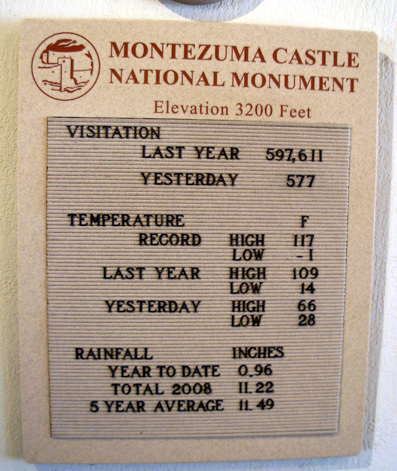 We thought we might get into too much snow at the higher elevations near Flagstaff so today we did just a day trip to the Verde Valley area to visit Montezuma Castle, Montezuma Well, and Tuzigoot. I'll talk about each site in a separate entry to keep them shorter. Let's start with a bit of history about the area and its first human inhabitants. 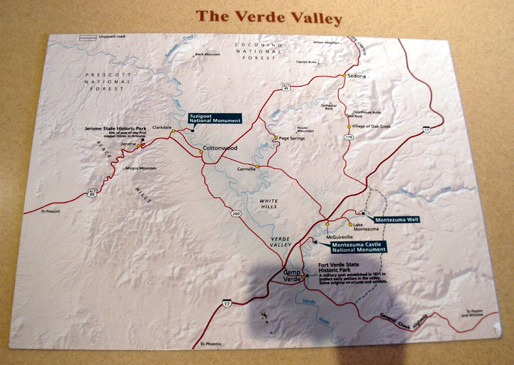 The Verde Valley has formed a natural corridor for big game and early human migration for ten thousand years or more. It is a transitional area between desert, grassland, and forest vegetation zones, providing the food and water that all life needs for survival. Over the millenia the climate of this area became more warm and dry. The vast grasslands disappeared, causing the extinction of several types of big game animals like mammoths, camels (! ), and huge elk. Early hunter-gatherers by relying more on agriculture and commerce with other cultures to sustain their lives. They traded minerals, textiles, jewelry, and other resources (by foot -- early ultra walkers!) over a vast expanse of the West and down into Mexico. And they forever changed the way people interacted with the land when they learned from the people who lived in what is now Mexico to rely on agriculture to supply their main source of food. Corn, beans, and squash were gradually hybridized to adapt to the Arizona climate and the tribes learned how to store it to last throughout the winter. Agriculture also transformed the way human society was organized into communities to grow and share the crops. They continued hunting available game and gathering available natural foods, but the emphasis was more and more on agriculture. 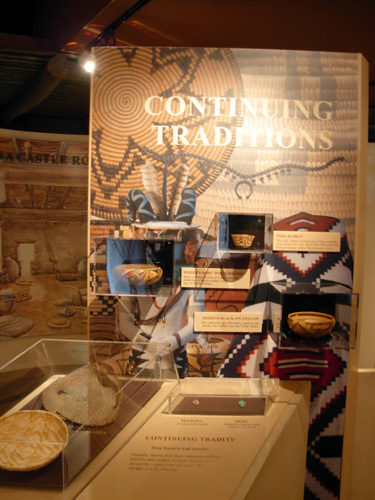 Around 600 AD the earliest dwellings in the Verde Valley were excavated into the ground and had roofs made of timber, brush, and clay. Small settlements have been found around the periphery of the valley and along the waterways. 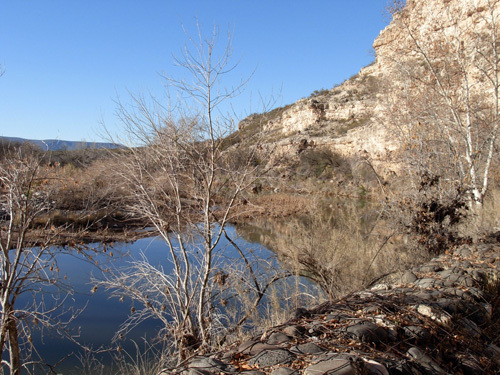 One example, the Pithouse Ruin (which we didn't see), is near Montezuma Well. It is believed that these structures were built by Hohokum peoples (Pima for "those who have gone") who migrated north from southern and central Arizona. The Hohokum are primarily known for building irrigation canals in the Phoenix area. That's a pretty advanced concept in that era. 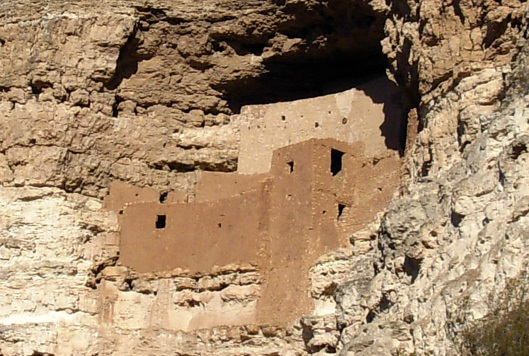 The pueblos, masonry dwellings built on hilltops and in cliffs, that we saw today were mostly constructed by Ancestral Pueblo people referred to by modern-day archeologists as Sinagua (Spanish for "without water") between approximately 1100 AD and 1400 AD. 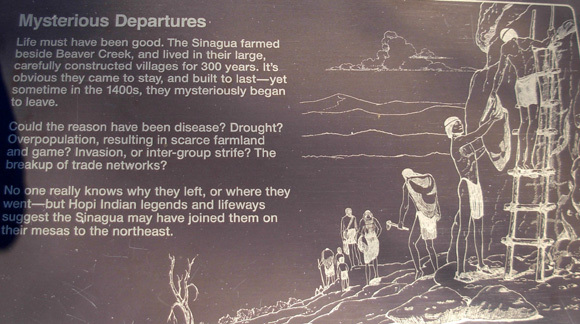 The Sinagua (pronounced seen-AH-wa) are one of many different prehistoric Southwest Indian cultural groups who interacted with extensive trade connections, practiced similar lifestyles, engaged in agriculture, and shared religious concepts and practices. They are believed to be descendants of the modern Hopi, Yavapai, and Apache people of Arizona. For unknown reasons they simply disappeared from the area around 1400 AD. The first Euro-American explorers to find these impressive cliff dwellings and large pueblos with standing walls in the 1870s couldn't believe they had been built by local indigenous people. They attributed their design and construction to the Aztecs, whose magnificent ruins they had seen during the Mexican-American war. 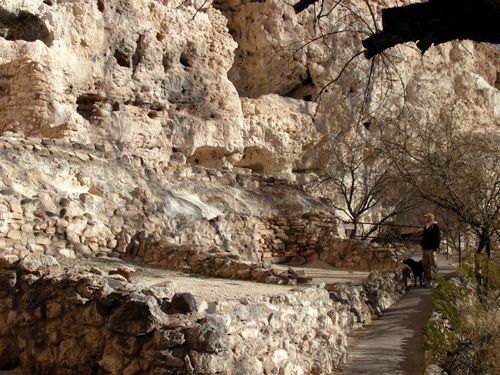 The explorers named two of the sites, Montezuma Castle and Montezuma Well, after the Aztec king. The names stuck and have never been changed. 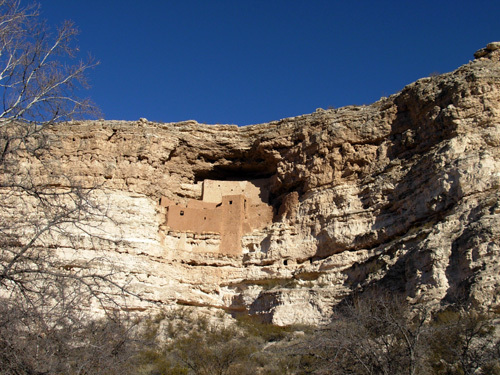 Montezuma Castle is an impressive five-story, 20-room prehistoric cliff dwelling that sits a hundred feet above the ground. It is stunning but it's not a castle. It's a wonder as much of it still exists intact, considering the vandalism, unauthorized excavations, and authorized visitation the monument has seen until recent years. Over 90% of the Castle we see today is part of the original structure built approximately nine centuries ago. Although the ruin became a national monument in 1906 and was partially restored and stabilized in the 1930s, visitors were allowed to climb ladders into the structure until the early 1950s. Now only park personnel and archeologists are allowed to go into it. You can read a lot more about the Castle's construction in a "virtual tour" at this link. It's not a video but a multi-page series of photos and text that is very interesting to read. The next photo of Jim and Cody near the cliff dwelling gives you a sense of how high the cliff rises above the ground -- and how high those folks had to climb up (or down) to get into their home. That photo also shows how tall some of the "younger" Arizona Sycamore trees are. Another cliff dwelling around the corner, "Castle A," is more deteriorated but you can get right up close to it. 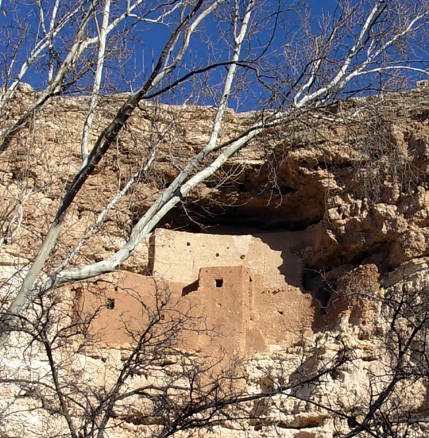 Montezuma Castle was part of a large community of people spread up and down the waterways of the Verde Valley. According to Park Service information, as many as 8,000 people may have lived close together in the valley in small villages like the Castle site. This site along Beaver Creek was perfect for its Southern Sinagua inhabitants. The two "castles" probably housed over a hundred people. Entrance to Montezuma Castle was gained by ladders. Historians and architects don't know if the rooms were built deep into the cliff for protection from enemies or more for environmental reasons. The rooms are toasty warm in winter, cool in summer, and high enough for nice views of the creek and protection from insects and flooding. There are ruins on top of the cliff above the Castle which would have been a logical place for sentries, although there is scant evidence of conflicts during this period of time. Daily activities like processing food were conducted up there. The land between the cliff and creek was saved for growing crops. Montezuma Castle is easy to reach on a rural paved road off I-17 at exit 283, about an hour's drive north of Phoenix or south of Flagstaff. The three sites we visited today are open every day except Christmas. Entry to the Castle is $5 per person or you can purchase a combined pass for both Montezuma Castle and Tuzigoot for $8 per person. Entry is free to nearby Montezuma Well. It's also free to all these sites for kids under age 16 and for folks with an annual, senior, or access pass for the national park system. We thoroughly enjoyed our visit to Montezuma Castle. What an impressive site on a bright, sunny day like today! Visitors must remain on the flat, paved loop that meanders for about a third of a mile below the cliff dwelling. There weren't very many visitors while we were there on this Tuesday morning but this board shows yesterday's total attendance was 577 people. Keep in mind that was a Monday in January, not a time you'd expect that many visitors. Here's my best tip: go see this stunning site but don't visit on a weekend in the spring or fall!! Divide last year's attendance by the 364 days it was open and you'll see why (an average of 1,642 people a day). You can bet there are a lot more people there throughout the day on a spring or fall Saturday or Sunday. It's a small park -- and parking lot. Because of Arizona's notorious heat, visitors are not only allowed but strongly encouraged to take their pets with them through these sites so they don't roast in vehicles in the parking lots. Cody enjoyed his history lesson, too! 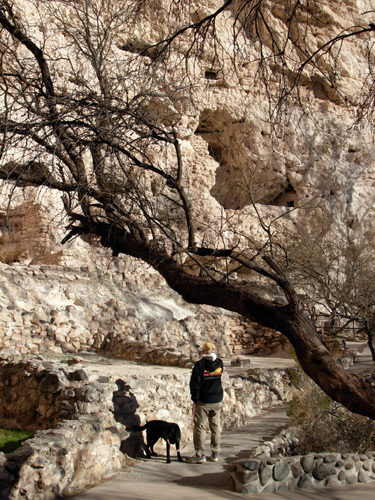 The only place he couldn't go today was into the nice visitor centers at Montezuma Castle and Tuzigoot (no visitor center at Montezuma Well). Pets small enough to be carried can go inside, however. There is also a wealth of information on the signs along the path outside. 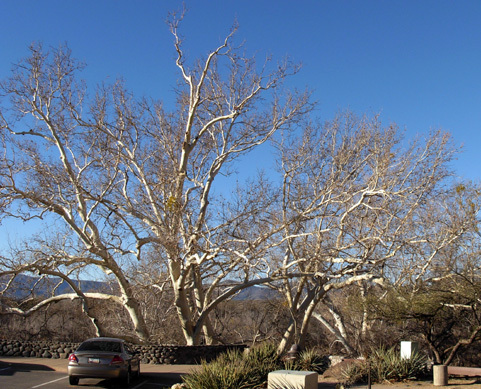 I was impressed by these magnificent old Arizona Sycamore trees near the visitor center at the Castle. The ranger indicated they are hundreds of years old, but not as old as the cliff dwellings. These ghostly white-trunked trees live near streams in the Verde Valley and often reach heights of 80 feet or more. The sycamore seedlings that are tough enough to mature into these beautiful specimen host a wide variety of native Arizona birds, insects, and burrowing critters. They provide shade when their leaves are out and people in the valley have used the soft wood for building homes for thousands of years. 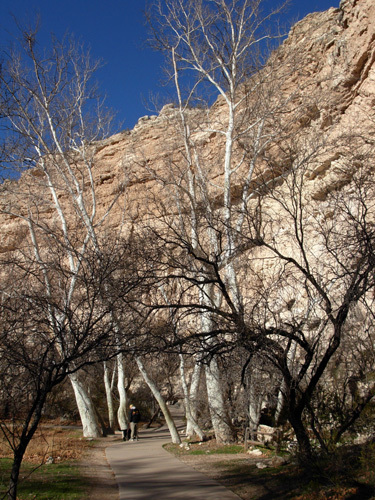 The support beams in the rooms at Montezuma Castle are from the Arizona Sycamore. Because of the fragility of the desert environment the Park Service is as vigilant in protecting its natural resources as it is the archeological wonders in this area. Visitors are not allowed up in the cliff dwelling any more and they must stay on the paved walkway. You can see a scale model of the dwelling in the visitors' center. It also contains artifacts found in the area and many exhibits featuring local flora and fauna. You can also visit the monument's website for photos and detailed information. The site is worth the cost of admission and more!